It wasn’t until recently that I once more began fishing in earnest. My uncle taught me and my sister to fish when I was 11. From then through high school graduation I was on the water as often as possible. Once I began college though, I didn’t have time for it and that trend continued when I moved to LA. After researching various fishing holes around the city my curiosity piqued in regards to the LA River. I grabbed my pole and some corn and have been enjoying fighting the carp ever since. The day this picture was taken started as most of my other fishing days. I packed a bag with corn, drinking water and of course mine and my daughter’s fishing poles. After getting our hair rigs set up and cast out I explained to her about knowing when a fish was biting. It wasn’t long after that when her rod started twitching. I set the hook for her (she’s 3) and immediately something felt wrong. After a few confusing moments the problem was obvious–a coot had become tangled in her line. Without anything to cover the poor bird with I had to improvise by using my t-shirt. Once I could see properly, the coot had only tangled her foot in the leader and wasn’t hooked at all. Her safe release was met by applause from onlookers who had gathered. No sooner had I released the coot than the unmistakable scream of a reel filled the air. This was a good fish and with an audience there, I felt the pressure to land it. 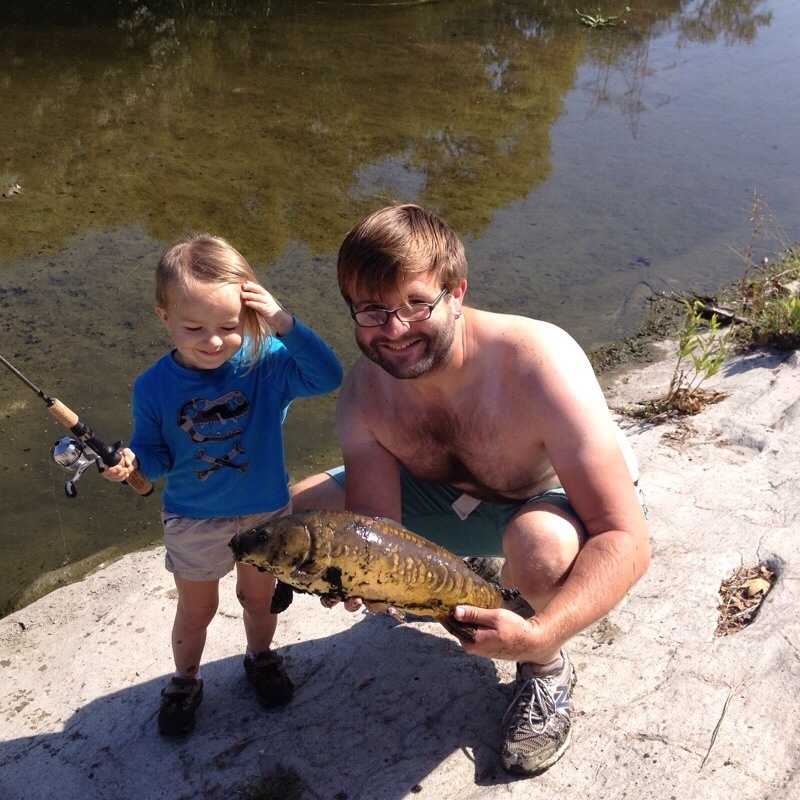 After seven-eight minutes, I pulled out this beautiful mirror carp. I had never caught one prior to this and I was quite excited. After taking a few photos I let the fish go. I hope to catch more just like this one. There’s so much fun to be had so close to home. It’s a great learning experience for the little ones too.